At this time of year, millions of Americans feel the tug to participate in what they consider the ultimate interaction with the natural world–hunting. For many hunters, it’s a time for sharing long-established traditions with family members and friends. The National Shooting Sports Foundation, the trade association for the firearms, ammunition, hunting and target shooting industry, notes that hunting seasons will be open for small game, big game and bird hunting across the nation over the next several months. Those who are successful in their hunts will stock their freezers with nutritious, locally obtained meat. Many also will share their bounty with food pantries to provide meals to the less fortunate. With the list below, NSSF offers a reminder of how to maintain your hunting traditions and, for newcomers and inactive hunters, how to establish or re-establish them this hunting season. Go hunting! It’s sounds simple, but the activity itself, whether you successfully take game or not, is a senses-heightening, fulfilling experience. Share a game meal at your table. This is one of hunters’ oldest and most favorite traditions, made sumptuous because the harvest and hunt coincide at this time of year. Today many people are making an effort to use sustainable, locally acquired foods–something hunters have practiced for a long, long time. Tell your hunting stories. Write them down. Take photographs and videos. Share your stories on social media or with an online photo album. Such records help keep your traditions alive. Use the firearm of your choice as long as it meets your state’s hunting regulations. These days more hunters, particularly younger hunters, are using modern sporting rifles–rifles based on the AR platform. If you prefer a wood-stocked, bolt-action rifle, that’s understandable, but NSSF encourages you to support the choice of firearm made by others. Modern sporting rifles may not look like “Old Betsy,” but after many hunting seasons, such firearms will carry the same meaning for someone as the “Old Betsy” that was passed on to you. Set an example for ethical behavior. Before hunting, review your state’s hunting regulations; during your hunt, practice good sportsmanship. The public overwhelmingly supports hunting, but unsportsmanlike behavior by even a few hunters can tarnish the reputation of hunting in general. Practice safety in the field, when traveling with firearms and when storing them at home. Practice the four firearm safety rules: Treat every gun as if it were loaded. Always keep the muzzle pointed in a safe direction. Keep your finger off the trigger until ready to take your shot. Know your target and what lies beyond it. You may have other traditions to honor. We hope so. 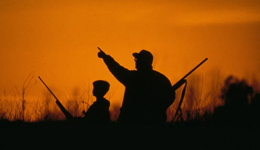 NSSF offers a number of resources for hunters, including www.wingshootingusa.org and video and literature titles covering firearm safety, hunter ethics and the hunter’s role in conservation that can be viewed at www.nssf.org/hunting and www.nssf.org/safety.